OFF SEASON ALERT> The seasons have changed and our lives are headed in a slightly new direction. I thought I was long overdue for a new post but when I logged on I discovered I had never finished the post below. The big update is this. I have taken a job as the Footwear Creative Director at The North Face. It is new, crazy and awesome. It also means we are moving the troupe to California. Do not worry, Nymbol and his friends will be a big part of our lives no matter where we live. Their magic has already proved invaluable during our transition. Now on to my original post. I was a little depressed after getting back from FaerieCon East. The Festival had allowed me to not think about the cool opportunity I missed out on. I thought we were about to move back to Portland but the Universe has other plans. (I now know what that plan was) On Monday morning I sat in our car a little disengaged while I drove Izzy to school. As soon as she got in the car she started to sing a song under hear breath. She had one of those school holiday concerts coming up and was practicing every moment she could. I didn’t recognize this particular song but really liked what I could hear of it. “Can you sing that out loud for me?” I asked. Without hesitation, (a rare event for Izzy) she burst out long a complete and beautiful version of “Walking in the Air.” It was beautiful and I loved the way she sung it. Although we had decided we would not be doing a holiday video a Bell rang between my ears. After the Friday performance I found Izzy’s teacher Mr. MaCarthy and asked him if he would be interested in a collaboration with Nymbol’s Troupe and the school. “Absolutely!” was his response. The van was loaded monday morning and by Noon Sam, Caven and I had descended on the school with creatures, lights, camera, and sound. The school didn’t really know what hit it. By two-thirty we had Mrs. Sullivan’s lovely piano track in the can and the young ladies and Blarney had made a great sound track. It was time fo our first real video take. As if on Cue Parents and kids started to descend on our taping and it was difficult to get things quiet. “Quiet on the set” means something far different to a bunch of kids then it does elsewhere. Comically it should be “Holy Crap,…..For the love of all that is Holy in every Religion Don’t move a Fricking Muscle for 2 minutes!”. Once that was made fairly clear we were fiiiiiiinally ready to tape. I felt bad that one of Izzy’s friends named Kaija finally melted because of the cold she had. Now pulled from the line-up after 3 hours of preparation it was a learning experience for all. 15 minutes later we had done a couple decent takes and once released the kids were all gone so fast our head spun. The next day Sam and I arrived in the morning and set up a mini studio in a side room in the school. We first grabbed Mr. MaCarthy and had a blast as he went jumping and frolicking down a trail next to the school. The kids were all amazing and more than just a little happy to get a little break from their math and science notebooks. Even though they were taken into a room with bright lights, a bunch of creatures hanging out and two parents they barely knew they were all spot on. With the theatre productions these kids do each year they are all pros. 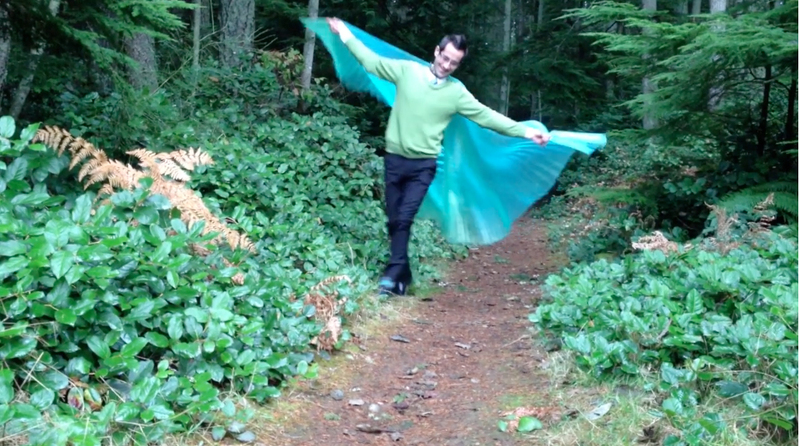 By the way, the wings in the video were a big hit with both girls and boys but I must say the boys were hysterical. Too funny. After a day of shooting we met at Caven’s house later that night and put the whole thing together. It was a late night but there was much laughing and fun as we found the right clips to insert into the video. By the next morning we had the video uploaded on Vimeo and were ready to show it off to the school. After calling Mr. MaCarthy for approval we brought a projector into school and premiered it for the kids. I wish I had a camera rolling or at least the sound so I could have captured their reaction. It was so much fun. We watched it one more time and the kids really enjoyed seeing their awesome selves on video. I know it is getting warmer now but when you are feeling a little nostalgic for the holiday season please take a look at all of our efforts HERE. Expect some new hijinks from Nymbol and Troupe very soon. There are many new adventures on our horizon.